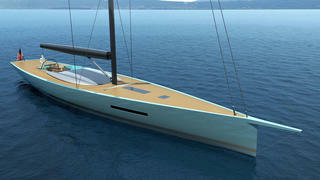 French designer Philippe Briand has revealed full details for a new 30 metre carbon fibre sailing yacht concept called Egoist. First announced in August 2016, this superyacht concept has been developed for owners who really want to get away from it all — including guests and crew. Egoist has just one cabin and has been designed to be sailed without any crew. 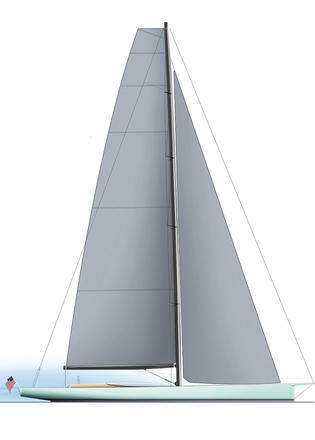 The carbon fibre sloop is a fresh take on a classic Eastern Seaboard sailing yacht and can also be used to race with a small number of expert crew with only three sails up. 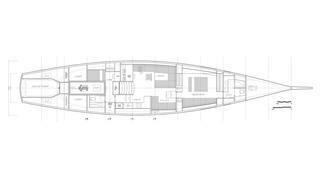 The newly revealed details show that the concept boasts a roomy en-suite master cabin forward with a large salon and adjoining galley amidships. Accommodation for two crew is located aft but could be used for other purposes should the owner choose to sail independently. The naval architecture on this yacht is geared towards a fast and very responsive sailing experience, with competent regatta veterans in mind. Briand has employed the timeless lines of classic sailing yachts for which he has become known but given them a contemporary twist to create a yacht suitable for an experienced, modern owner. Egoist is the latest in a long line of sailing superyachts from Briand’s drawing boards, including the Perini Navi yachts Sybaris and P2. Other projects currently under development at the French studio include a new 28 metre series yacht and three bespoke yachts ranging from 55 to 90 metres in length.